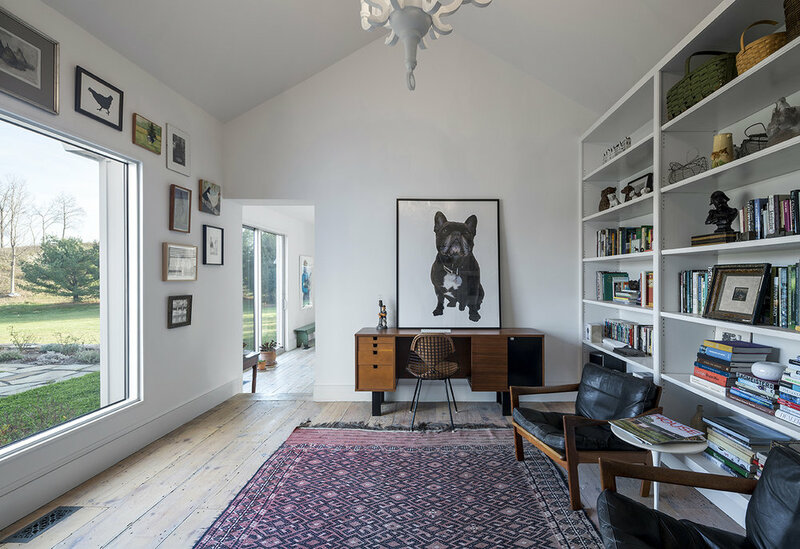 This project included careful interior renovations within an existing 18th century farmhouse along with more substantial changes to two additional structures (previously added to the house by the prior owners). The older portion of the house received new, historically contextual windows along with changes and restorations to interior finishes, while the more recent additions were stripped back to their framing and re-clad in a combination of gray standing seam metal and painted boards and battens. These alterations removed all extraneous decorative elements from the exterior of the non-historic pieces and permit the gabled forms of each volume to read more forcefully and without distraction. These more recently constructed one-story volumes also received expansive sliding doors at the location of a new open kitchen and living room; this low volume is the social hub of the dwelling. Alterations removed all extraneous decorative elements from the exterior of the non-historic pieces and permit the gabled forms of each volume to read more forcefully and without distraction.